Conditions: Mix of cloudy and sunny during the day, foggy in the morning, highs in the mid-60s to low 70s and lows in the high 40s – low 50s at night. I hiked in a long sleeve synthetic shirt and pants mostly. I was warm and snug in my ~30 degree bag at night. Highlights: Tallest summit in North Carolina and the tallest summit east of the Mississippi, stunning scenery, challenging trails, diverse forests, wildlife, Mountain to Sea Trail. Distance from Cincinnati: Approximately 6.5 hours by vehicle. GPS directions to the Black Mountain Campground, Pisgah National Forest, North Carolina. The directions are straight forward. Permits: There is a fee for camping at Black Mountain Campground and is first come, first serve. There is no permit required for camping at Deep Gap (also first come, first serve). Description: The Black Mountains are the highest mountain chain east of the Mississippi river with Mt. Mitchell being the tallest summit at 6,684 feet above sea level. The entire ridge is approximately 10 miles long and contains 14 peaks, all over 6,000 feet, and is known as the Black Mountain Crest. * A large portion of the hike coincides with the Mountain to Sea Trail. For our hike, we did not explore the entire Black Mountain Crest, but instead started from the Black Mountain Campground at the base of Mt. 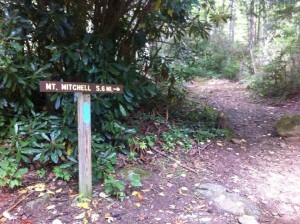 Mitchell and hiked to Deep Gap, a large established campground in Pisgah National Forest. Do not underestimate the Black Mountains! The hike from Black Mountain Campground along the Long Arm Ridge to the Mt. 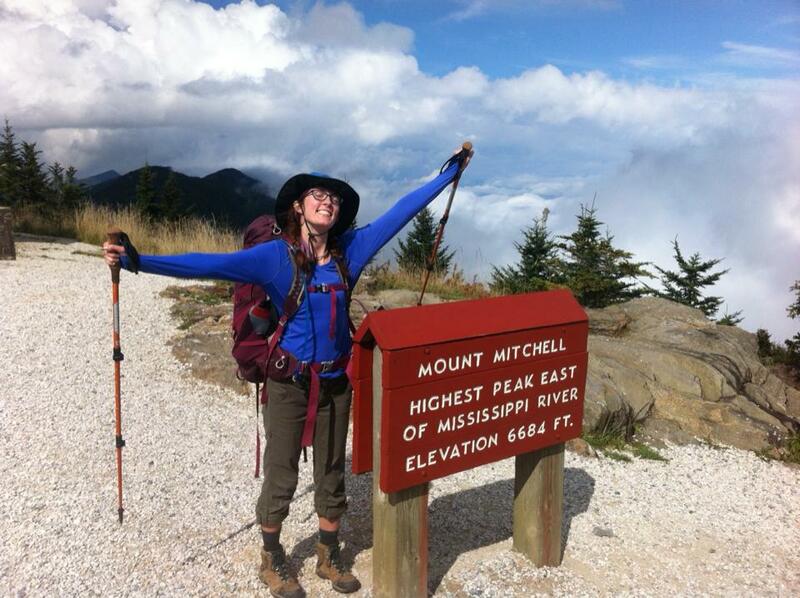 Mitchell summit gains approximately 3,700 feet in elevation over 5.6 miles and is steep and technical in many areas. For most of the hike, you are on an exposed, narrow ridge above the clouds. Once you’ve gained the majority of elevation, the elevation change between the 5 additional peaks is relatively small. The lowest elevation is Deep Gap, which is at approximately 5,800 feet. On this hike, you summit Mt. Mitchell (6,684ft), Mount Craig (6,647ft), Big Tom (6,580ft), Cattail Peak (6,584ft) and Potato Hill (6,475ft), all in one day. Day One: Drive from Cincinnati to the Black Mountain Campground and stay there for the night. There are flush toilets and showers. Note: the trail head for Mt. Mitchell is located inside the Black Mountain Campground. There is a large Pisgah National Forest trail head across the street but it is NOT the correct way to go (trust me, because I ended up ad ding ~3 miles to my trip by starting out at the wrong trail head). Day Two: Start at the Black Mountain Campground and follow signs for Mt. 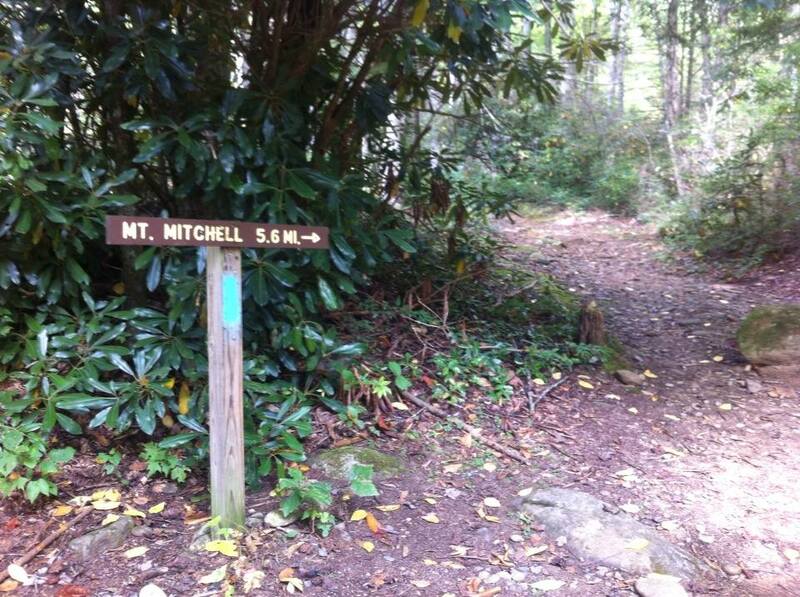 Mitchell and immediately begin ascending for 5.6 miles. You will pass two junctions along the way, one for Higgin’s Bald, which is an alternative trail that will take you to the same place, and one for Commissary Ridge. Follow the signs for the Mt. Mitchell summit. You will eventually reach the paved and suddenly civilized summit of Mt. Mitchell.The summit was crowded and full of people who drove up for the view. Take the opportunity to fill up on water at the Mitchell summit area and enjoy the panoramic views. Continue from the summit to the Deep Gap trail head and to Mount Craig. From Mount Craig, follow the trail to Big Tom and down along the trail. At some point, you will transition from the Mt. Mitchell State Park to the Pisgah National Forest, right around Cattail Peak. At a few points in this area, there are a series of fixed ropes to assist in navigating down the steep terrain. The last peak of the day is Potato Hill (I still have no idea why this steep mountain was called a hill). You are exposed on a narrow ridge and high above the clouds. Continue downhill until you reach a large clearing with an established fire ring and set up camp for the night at Deep Gap. Be sure to hang your food for the night because you are in a bear sanctuary*. Day Three: Start climbing up the way you came from Deep Gap, back up Potato Hill and Cattail Peak. You will re-enter Mt. Mitchell State Park (there will be signs posted on the trees) and shortly after you will arrive at a junction. Turn onto the trail marked 191A and continue on down. This part of the trail is very steep and rocky, but beautiful and exposed. You will come to another junction, and you’ll want to turn right onto Maple Camp Ridge. This trail is flat, open and easy. You’ll be able to move quickly along it until you meet up with the Long Arm Ridge once more. From here it will be a steep and steady descent. We refilled our water once more along the Long Arm Ridge. Consider doing the Higgin’s Bald side trail to add different scenery along your way back to Black Mountain Campground. The side trail only adds about .25 miles. Water: I carried 3.5 L of water (a 2.5L reservoir and 1L Nalgene.) We filled up at the Black Mountain Campground, the Mt. Mitchell Summit, and at a stream located along the Long Arm Ridge Trail. There is a water source near Deep Gap, but it is a .5 mile hike away from the campsite. Options: To save mileage on the second day, consider hiking up the Long Arm Ridge and staying the first night at the Commissary Ridge campsite approximately 4 miles up. Another option is to drive to the top of Mt. Mitchell and hike to Deep Gap from there. There is camping near the Mt. Mitchell summit as well, though you will need a permit for these spots. *Additional Notes: As mentioned, part of the hike to Deep Gap is through a bear sanctuary. Please practice proper bear awareness through these areas such as properly hanging all of your food, food packaging, cooking equipment, and other scented items. Also, make a note to be somewhat loud when hiking, so as to potentially warn any nearby bears of your presence; simply raising your tone higher when talking should work. The occasional “HEY BEAR!” is a good idea, too. Additionally, these trails are steep and rocky and I highly encourage the use of trekking poles and boots with ankle support. *An image of the entire Black Mountain Crest.